DIW Berlin: Is there a bubble in the German housing market? Is there a bubble in the German housing market? What is a housing market bubble and what can be its consequences? According to Stiglitz (1990), a housing bubble is defined as a misalignment of market prices and their fundamental determinants of supply and demand due to speculative behavior of investors. This causes risks to the economy. It signals investors to enter the housing market and to build new homes, which is, in fact, a result of biased house prices rather than real scarcity. As a consequence, resources are misallocated – an inefficiently high amount of capital is used in the real estate sector. A bubble could become a real threat to the economy if construction is financed to a large extent by mortgage loans. In case of a bursting price bubble, many households and investors might be overly indebted, which would lead to an increase of bad loans. This could have a negative effect on households’ consumption behavior and more importantly can result in a severe banking crisis, as experienced in the Great recession in 2007-2009. In the light of the recent decisions of the European Central Bank (ECB) and picking up early warnings formulated by the German Bundesbank (Finanzstabilitätsbericht 2014, Bundesbank monthly report 10/2013, Financial Times 2014/02/17), the German Minister of Finance, Wolfgang Schäuble, stated in July 2014 that for the German economy, the “level of liquidity is too high and central bank interest rates are too low”. Because of the recent warnings by the German central bank, he will have a close eye on the real estate market developments (FAZ, 2014/07/19). In the same sense, the International Monetary Fund (IMF) called on the German government to improve its macro-prudential toolkit in order to be prepared in case of misaligned price developments (IMF Staff Report 14/216). However, the threat of a bubble is not assessed unanimously in the public debate. Some authors refer to a descriptive analysis of housing market data and find only little evidence for an overheating of the housing market. For example, the “bubble index” (empirica bubble index Q1/2014), published by the consultant empirica AG, analyzes three key indicators to evaluate the likelihood of a bubble. 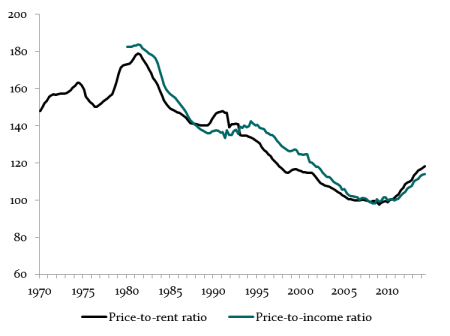 On aggregate, neither the multiplier (the ratio of the price-to-rental income, see Figure 1), the price-to-income ratio nor housing starts indicate a misalignment of housing market development to its fundamentals. This view is shared by Olga Tschekassin, analyst at the Bruegel thinktank (Bruegel, 2014). Ralph Henger, analyst at IW Köln, argues that house price bubbles are always associated with explosively expansions of mortgage interest loans. This, however, cannot be detected yet (IW-Nachrichten, 2014/06/20). Indeed, the German housing market is widely perceived as being highly stable and as not being prone to speculative movements (The Financial Times, 2014/06/23, Kofner, 2014). Other authors point out that at least the ingredients for a speculative bubble are present (Jordà et al. 2014, FAZ, 2014/06/20 ) and prices are already to some extent biased by non-fundamental motives, i.e., the safe haven effect in the light of the European debt crisis and the search for yield of foreign investors (Sachverständigenrat, 2013). However, more elaborate studies on house price movements in Germany are scarce. There are only four papers dealing explicitly with the current market developments – and their findings are mixed. 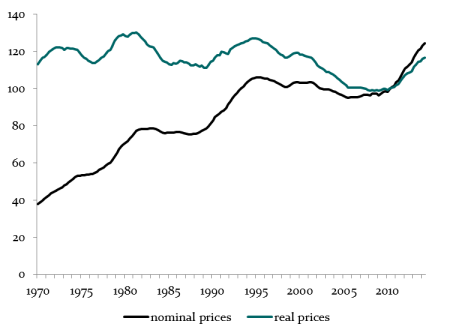 The first study by Chen and Funke (2013) analyzes aggregate house price data from 1987 to 2012. The authors apply a relatively new approach proposed by Phillips et al. (2011a, 2011b), which is essentially a unit-root test for explosive behavior in time series data. The authors conclude that on the aggregate level, no signs for the emergence of a speculative house price bubble can be detected. However, the major shortcoming of this study is the use of nationwide house price information. As pointed out by several authors, house price dynamics vary significantly across regions (Goodman and Thibodeau, 2008; Hwang and Quigley, 2006). Thus, signs of bubbles are hardly detectable in national time series. The second study by an de Meulen and Micheli (2013) picks up the spatial dimension of Germany’s housing market. The authors analyze monthly data of metropolitan house prices from 2008:M1 through 2013:M1. Based on more powerful tests, as proposed by Homm and Breitung (2012), they conclude that explosive price movements can only be detected in selected regions and only for one market segment – that of flats in apartment buildings. In summary, the authors conclude that the signs for a speculative house price bubble are weak. However, this study focuses on a very short period of time and some few selected markets, which raises some doubts on the generality of their findings. The most prominently cited work is that of Kajuth et al. (2013) who follow a “classical" approach by regressing house prices on their fundamental values, i. e., per capita housing units, GDP, Population density, share of persons aged between 30 and 55 in total population, unemployment, 10-year real mortgage rates, and real growth expectations. Using data for more than 400 regions in the period from 2004 through 2012, they capture the entire spatial variation of the German housing market. Kajuth et al. (2013) find that for most analyzed regions, house prices reflect quite well the economic conditions. However, they find a substantial overvaluation by up to 25% in metropolitan housing markets, which stands in sharp contrast to the findings of An de Meulen and Micheli (2013). One explanation might be the shortness of the period analyzed. The authors estimate an “equilibrium" price in the period from 2004 to 2010 and calculate the fundamental price for the period from 2010 onwards using estimated coefficients. 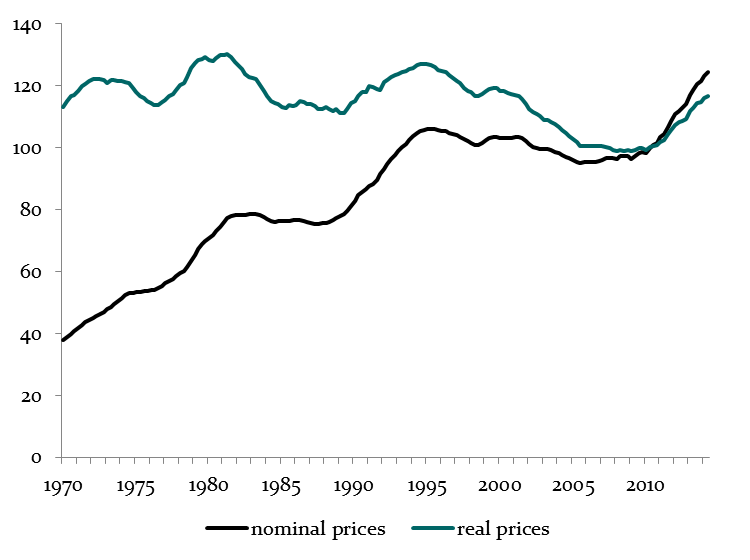 However, assuming that housing markets were in equilibrium in the period until 2010 is somehow counterintuitive. At least during the Great recession (2007-2009) house prices should have been biased substantially, which results in biased estimates of the influence of fundamental prices in the post-crisis period. Recently, Kholodilin et al. (2014a, 2014b) showed that first signs for speculative price bubbles in urban housing markets in Germany are present. The authors analyze data on newly built and second-hand apartments in 127 German cities from 1996 to 2013. They argue that the likelihood of a speculative bubble is high when prices sharply increase and decouple from rents, that is, when they follow an explosive trend, while the latter do not. Based on this definition and the Homm and Breitung (2012) test procedure, the authors find potentially speculative price movements in about one sixth of the urban housing markets. Still, they detect no bubble on the national level when analyzing aggregate series of house prices. They conclude that in the light of the sound fundamentals, the relatively small segment of newly built apartments and the stable volume of real estate loans, the threat for the German economy is modest. There is no clear cut evidence of speculative price movements in the German housing market. Depending on the period analyzed, the methodologies used and the level of spatial disaggregation, the studies available arrive at different results. Discussants who rely on descriptive assessments mostly conclude that the recent price movements are not “irregular” which is also found for the other commonly used indicators, particularly the amount of mortgage loans, the price-to-rent or the price-to-income ratio. Studies analyzing national time series also conclude that there are no signs of speculative price bubbles. However, evidence based on regionally disaggregated data indicates first signs of speculative behavior of investors in selected urban areas. But no study concludes that there exists an immediate need for political action. Nevertheless, some authors conclude that even if prices, on aggregate, are still tied to their fundamentals, politicians should indeed have a close eye on market developments, in particular on the regional level. An de Meulen, P., & Micheli, M. (2013). Droht eine Immobilienpreisblase in Deutschland?. Wirtschaftsdienst, 93(8), 539-544. Chen, X., & Funke, M. (2013). Renewed Momentum in the German Housing Market: Boom or Bubble? (No. 4287). CESifo Working Paper. Goodman, A. C., & Thibodeau, T. G. (2008). Where are the speculative bubbles in US housing markets?. Journal of Housing Economics, 17(2), 117-137. Homm, U., & Breitung, J. (2012). Testing for speculative bubbles in stock markets: a comparison of alternative methods. Journal of Financial Econometrics, 10(1), 198-231. Hwang, M., & Quigley, J. M. (2006). Economic fundamentals in local housing markets: evidence from US metropolitan regions. Journal of Regional Science, 46(3), 425-453. Jordà, Ò., Schularick, M. H., & Taylor, A. M. (2014). Betting the house. Journal of International Economics, in press. Kajuth, F., Knetsch, T. A., & Pinkwart, N. (2013). Assessing house prices in Germany: Evidence from an estimated stock-flow model using regional data (No. 46/2013). Discussion Paper, Deutsche Bundesbank. Kholodilin, K., Michelsen, C., Ulbricht, D. (2014b): Trotz stark steigender Immobilienpreise, deutschlandweit noch keine Blase, DIW Wochenbericht 47/2014. Kofner, S. (2014). The German housing system: fundamentally resilient?. Journal of Housing and the Built Environment, 29(2), 255-275. Phillips, P. C., S.-P. Shi, and J. Yu (2011a). Testing for multiple bubbles. Research Collection School Of Economics. Phillips, P. C., Y. Wu, and J. Yu (2011b). Explosive behavior in the 1990s NASDAQ: When did exuberance escalate asset values? International Economic Review 52 (1), 201-226. Sachverständigenrat zur Beurteilung der Gesamtwirtschaftlichen Entwicklung (2013). Gegen eine rückwärtsgewandte Wirtschaftspolitik. Jahresgutachten 2013/14 (No. 2013/14). Stiglitz, J. E. (1990). Symposium on bubbles. The Journal of Economic Perspectives, 13-18.